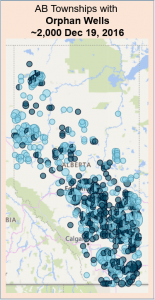 How Many “Orphan” Oil & Gas Wells Does Alberta Have? At the end of 2016, there were about 2,000 wells in Alberta deemed to be “Orphan”* Wells. Those wells have been plotted against the Alberta Township System. The mapping of Orphan Wells at that time shows a sparse distribution across the province. In quoting the number for Orphan Wells, we recommend using phrases like, “it was about, or it was approximately, 2,000 at the end of 2016”. The graph provided differentiates between the two types. Orphan Wells, which are to be Abandoned (the well to be cut and capped) are showing in light blue. And are usually counted in the total Inactive Well number. Orphan Wells, which are to be Reclaimed, (the land restored) are showing in dark blue. The OWA provide updates to their data about once a quarter. To interact with the specific dashboard above and see the values change, please see this link. To see numerous other dashboards on the subject, please see this link. Previous PostPrevious How Many “Inactive” Oil & Gas Wells Does Alberta Have? 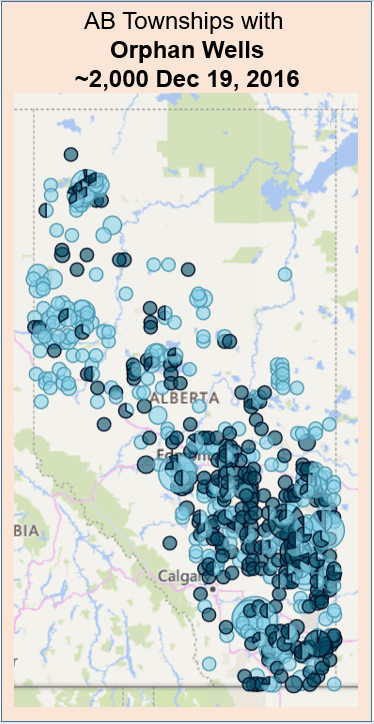 Next PostNext Is the Number of Alberta Inactive Wells Growing?